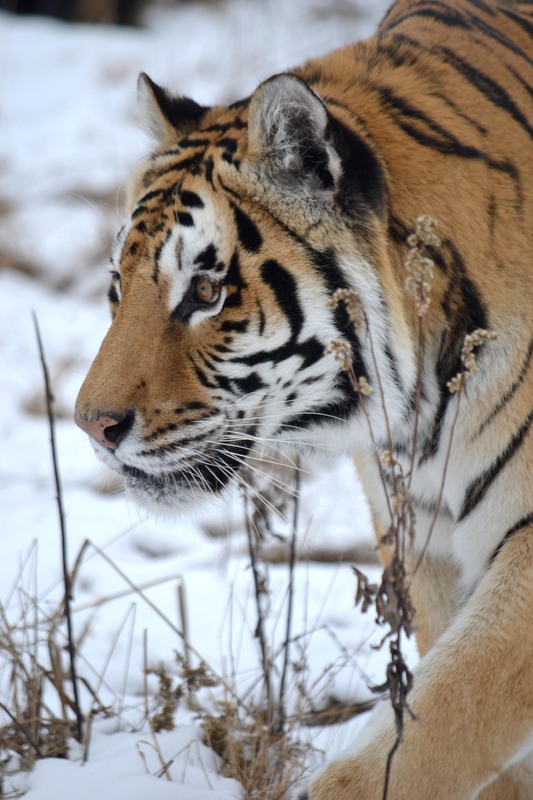 Titan, born in 1996, came to TWS in 2006 after his owner was tragically killed by another tiger, Tango. Authorities called TWS to help with the emergency, however it was too late for both the owner and Tango. 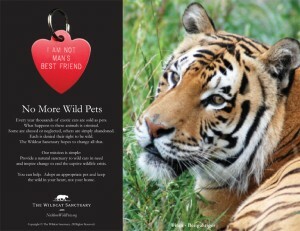 Titan along with another tiger, Lilly, were seized and placed with us. Titan was severely malnourished upon arrival. 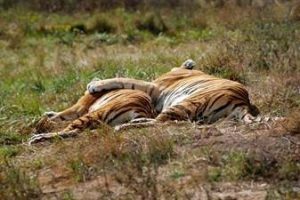 We believe his owner fell on hard financial times and just couldn’t afford the proper diet for the tigers. Those close to the owner said she truly cared about the animals but sometimes that just isn’t enough, especially when it comes to housing potentially dangerous exotic animals. Today, Titan is thriving and living a very plush life here at the Sanctuary. Although he came with Lilly, they were not living together before they arrived. After a few years of living next to each other, it was obvious they wanted more so we decided to merge them together. There were a few scuffles at first, but once they figured out their places, they’ve become inseparable. Lilly passed away in the summer of 2015. 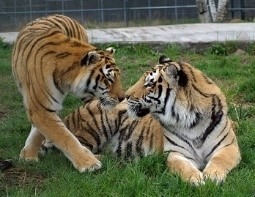 Titan has adjusted well to living alone again and can be often found playing along the fence with tigress Sabrina. Titan is a very relaxed cat, taking everything in stride. His pool is definitely his favorite thing in the summer time and he loves to chase Lilly in and out of it splashing around. Another favorite has to be the fire-hose hammock; big enough for two and very cozy. You can help provide daily care for Titan by becoming his sponsor. Your help will be greatly appreciated. Lately, he’s been picky about his food, which is not like Titan at all. A few medications have helped his appetite, but we felt he needed a full exam and diagnostic tests performed by specialists at the University of Minnesota. We wanted to have a clearer picture of what medical issues he may be facing. Though he’s been eating well this last week and back to his social self, initial test results are most consistent with early signs of cancer. We will have full results shortly. He’s being given medication to assure he’s comfortable. Of course, we’ll continue to provide him loving care hoping he has many more days to enjoy here with all of us. After his big day being transported to the University of Minnesota for diagnostics, Titan came right up on morning rounds to chuff at his caretakers. From the outside, he still looks like our boy Titan. A magnificent tiger who has beat all the odds. Unfortunately, his test results came back today with the diagnosis of advanced leukemia and anemia. We are treating Titan with oral medication to keep him comfortable. As long as he continues to eat, be active and show no signs of pain, he will be with us. He has been strong through this, just as he has been with all of the battles he has faced in his life. He deserves to leave with dignity when it is that time, and we will give him that gift. But for now we celebrate his life and enjoy our time with him. Thank you so much for your support that helps us provide the care Titan needs. Because of you, so many here are able to live out their days in peace and comfort – as we all want for them. And thank you so much for keeping Titan in your thoughts. I can’t believe we had to say good-bye so soon. Even though Titan was recently diagnosed with leukemia, we thought he had several happy months ahead of him. His blood results came back that the disease was further along than first diagnosed. Autoimmune suppressants were recommended to slow the cancer, but unfortunately, it slowed Titan down completely. It was time to reunite him with his brother Tango, and love, Lilly. There is no other cat, besides founding tigress Meme, that embodies The Wildcat Sanctuary’s reason for being more than 20-year-old Titan the tiger. So much so that, over the years, he became the face of the Sanctuary through videos, brochures, posters and our No More Wild Pets campaign. He was a tiger that had beaten all the odds. 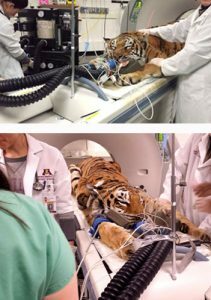 He was a former exhibit cat that had seen starvation not once, but twice. He tragically lost his brother Tango, after Tango killed their owner. He arrived in 2006 with Lilly, full of anger and fear. It took months before he would greet his caregivers without a roar and it took a year before any man with facial hair or a hat could approach his habitat without him charging at the fence. But his tragic history isn’t what defined him, it was his capacity for forgiveness. Love and patience prevailed. He learned to trust again and became one of the most charismatic cats at The Wildcat Sanctuary. When he let go of his anger, he found peace and became a gentle leader for our cause. His gentleness remained even through his last days. Titan had two major loves during his life. His brother Tango, whom he had lived with since birth until his death in 2006. And then Lilly. Lilly knew they were meant to be together from the moment she laid eyes on him. It took two years of living along a shared wall before they were personally introduced. After a few play dates, they would spend the rest of their lives together until Lilly passed away last year due to a heart condition. Titan was a strong and kind leader. He chuffed hello, enjoyed patrolling his habitat and saying hello to Sabrina along the shared wall. His habitat was located in the heart of the Sanctuary near the Memorial Pavilion, appropriate for such a leader. On warm summer days, you could find him swimming across Tiger Splash and then lounging on the ledge with his head on the grass. He also enjoyed enrichment. Lilly always allowed him to play first, out of respect. And this majestic leader would rip into the paper and run like a kitten across their habitat. He loved to show this silly side to our donors and volunteers as well. He enjoyed doing this even during this last month with his holiday enrichment. Titan was also humble. And I know he looks to the new generation of rescued big cats to continue to guide our work and rescue more cats in need. We can honor him by saving others. And with your continued help, we will. Titan, you have led us this far on our journey to create a world of compassion for animals. We will honor your legacy by carrying on such an important mission. Love to you our gentle leader and enjoy your new found freedom.